Who let the animals in the pool? Get crazy with this jumbo wacky 54-in animal inspired ride-on float. This Laugh Out Loud inflatable float will put a smile on your face. Kids will have a blast riding the waves on the back of a big colourful milk cow complete with horns and a long tail! Constructed of durable vinyl with 2 sturdy handles, this character ride-on is sure to keep you afloat all summer long. Large enough for 2 kids or 1 adult. Includes repair patch kit. Escape Your Worries, Drifting in Elegance! Lay back and drift away to an island retreat with the Drift + Escape Inflatable Pool Lounger. This luxurious float is designed with the ultimate relaxation in mind. With a contoured high back, mesh seating, and ample arm rests, you will forget your cares and worries as you soak up the summer sun. Keep your favorite drink nearby too, with the built-in cup holder. The premium colorfast polyester fabric covering is both soft and durable, so you can enjoy your little piece of paradise for many years to come. Choose the quality and comfort youve come to expect with the Drift + Escape line enjoy tropical relaxation in your Inflatable Pool Lounger. The Oversized Cooler Couch inflatable will give you command of any pool party. Made of heavy duty vinyl you will sit high above the fray while taking in the summer rays. When the party starts you will be fully stocked with your on board cooler that stores cans and ice. This float will make you the hit of every party. It comes with dual drink holders to keep your thirst quenched. The Fabric Covered Suspending Chair is covered in durable nylon; the same durable nylon that's used in river rafts, so it's designed to last. Extra comfortable with a relaxing head rest, you can float suspended for hours while you sip cool drinks from either of the chair's dual beverage holders. Pirate action on the high seas of the pool! The Galleon Raider Inflatable Pool Toy will provide kids with hours of imaginative pool play. Plenty of seating for many pirates on this inflatable ship complete with its own plank-style slide. Kids will love the cool graphics, the rope surround, and swim-through seats for quick escapes. Cast away and see where the adventure takes your kids today. 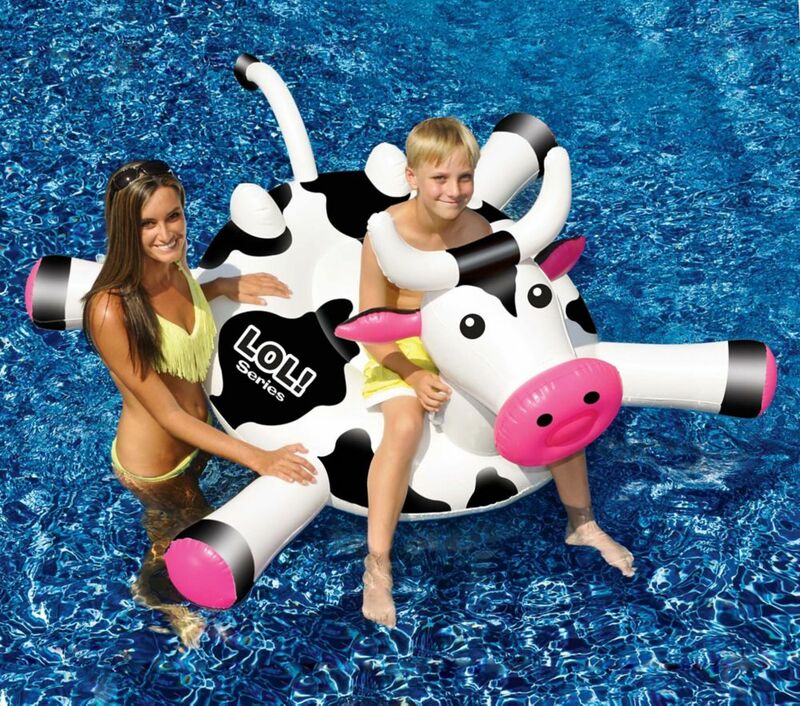 LOL 54-inch Cow inflatable Ride-On Pool Toy Who let the animals in the pool? Get crazy with this jumbo wacky 54-in animal inspired ride-on float. This Laugh Out Loud inflatable float will put a smile on your face. Kids will have a blast riding the waves on the back of a big colourful milk cow complete with horns and a long tail! Constructed of durable vinyl with 2 sturdy handles, this character ride-on is sure to keep you afloat all summer long. Large enough for 2 kids or 1 adult. Includes repair patch kit.